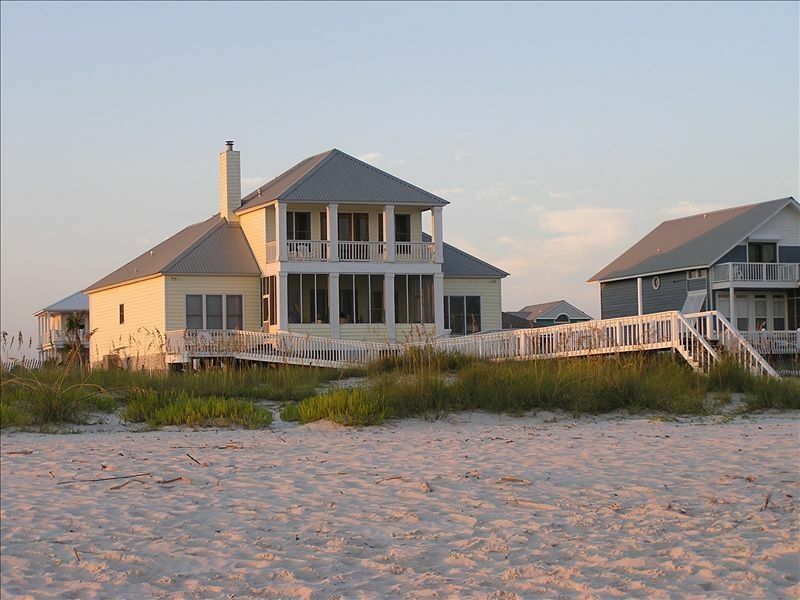 Appropiately named 'PICTURE PERFECT' this is a Ready to Rent, Beautifully decorated, 3000 plus square foot home directly on the Sugar White Sand Beach of the Gulf of Mexico in the Fort Morgan area of Gulf Shores, Alabama. Very low density beach, just 14.4 miles from Highway 59 in Gulf Shores. Located in Morgantown. Homeowners association provides access to a swimming pool and tennis courts, just a short walk from the beach front house. Great Room complete with 50" HD TV, DVD, stereo, wet bar, and fireplace. This den area opens onto a large screened-in porch that leads to decks and a private board walk over the dunes to the beach. Complete kitchen on the main level with every thing you will need to enjoy your stay, including a separate beverage refrigerator and a commercial ice maker(will make over 30 lbs of ice per day). Satelite 'DISH' TV, 120 channels. DSL LINE and/or Wi-Fi for your computer connections. Master bedroom suite downstairs with 42' HD TV, DVD, king bed, and very nice full bath area and plenty of closet space. Three other bedrooms on the main level with new mattresses as of October 2017. Two with two queen beds and one with two twin beds. Queen bedrooms furniture was also changed out in October 2017. The west queen room has a private full bath. The other two main level bedrooms share a full bath. Oversized master suite upstairs has king bed, sitting area with 48' HD TV, DVD, and fireplace. This room opens to a large covered porch and provides a wonderful view of the Gulf as well as beautiful sunrises and sunsets. A large bath with his and her counters and lavatories, separate garden tub and shower, is also located upstairs for the enjoyment of the master bedroom suite. Complete kitchen on the main level with everything you will need to enjoy your stay including a separate beverage refrigerator ane stand alone commercial ice maker. A very peaceful place to spend your vacation. Shopping, golf, nature areas, and historic areas all with in a 15 to 30 minute drive. The house is perfect for families! We enjoyed the beach setting and the large kitchen to make all of our meals. It was perfevt and we would go back!! The whole family enjoyed our stay and hope to return. Fabulous house and neighborhood surrounding. House is first class and neighborhood is well kept with 2 swimming pools and tennis courts. Beautiful house inside and outside. The house is well kept and had all the things needed to enjoy our stay. The owners were very helpful with written instructions and information about the house, neighborhood, and the surrounding area. It was a wonderful vacation at the beach. A fantastic place to have a family vacation. Beautiful Home with every thing you need to enjoy the surrounding area. very nice beach home spacious and comfortable. we had 11 people there with us, 7 adults and 4 children. All had a good time. Beach was not crowded water was perfect with only a few tiny jellyfish. Would definitely consider returning in the future. A $500 deposit is required to hold the reservation and as security. It is refunded 2 weeks after departure after we have our cleaning services report.